March 25th is the day, hell, that ain't long, is it? 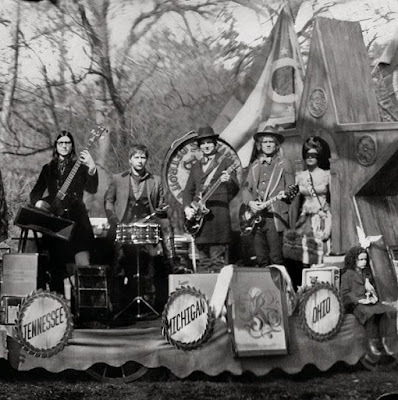 The Raconteurs announced the other day that their latest record, Consolers of The Lonely, would be released on that very day in every format. I'm betting that White and Benson have got at least one "Steady As She Goes" on this new disc. Now most of you are familiar with Mr White and his Striped work, are you not? You surely know he's got a way with a song, but his fellow Detroiter, Brendan Benson, can write and sing a catchy tune as well. Check the band's upcoming tour dates here. On behalf of XL Recordings and Warner Bros Records, many thanks for plugging “Consolers Of The Lonely” and The Ranconteurs’ pioneering, ‘fans-first’ release concept … .. it was a pity about the early leak via iTunes, but thanks also, on behalf of the labels and the artist, for not posting any pirate links. If only they could make something as special as 'Tiny Spark'. Kudos on the web sheriff compliment!